Susan Levy kindly shared these photos with us. With thanks to Glenn Stevens for these historical WW1 recruitment documents. If you have any information about these men, please leave a comment. Thank you to Diane Crooks for sharing these photos with us. The government wharf at Southeast Cove can be seen in this photo. Kevin Rhodenizer and Debbie Landry are the children. After a storm, the inside portion of the Southeast Cove government wharf was damaged. The outside section was still used to dock boats. Stella Glerum’s house before it was torn down. This house used to stand on the hill above Gurney’s canteen (beside Tyrone’s). Melissa shells peas in her pot. The Levy home is on the left and you can see the Slaunwhite house on the right. John Cross – clearing off the hockey rink across the road from the general store. Velma, Millicent (Millie), Lawrence, Ena, Harley, Shirley. Lawrence’s and Ena’s 50th anniversary. Gladys Cross’s house before renovations. Diane Crooks makes friends with Dandy’s (Willis Cross) calf. The pigsty in back was given to Gurney Wilson (Angela Connoly’s) and still stands on that property. Ruby Heisler Cox, Carrie (Heisler) & Bruce Levy, Douglas Levy at Bruce and Carrie’s wedding. The flower girl is believed to be one of Melda’s daughters, Jackie. You can see the “Old Maid’s House” still stands in this photo. Lady in photo is Pamela Geddes, a friend of Diane Crooks. In this photo of the “Little Green House”, you can see a house up on the hill that used to belong to William Cross, who was the father of Gilbert “Gippy” Cross. This is in Northwest Cove in front of Earl Baker’s house. In the photo are children of Mabel & Willis Crooks. The lobster factory is on the right in the background. 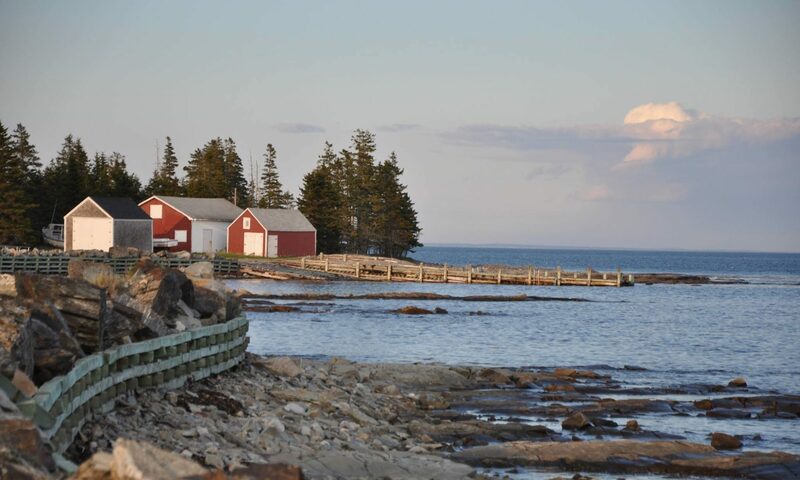 Dorothy Wilson stands on the Tancook wharf. Bentie Heisler, Dorothy Wilson, Ruby Heisler – making music. Melissa & Hibbert Baker’s house in 1956 (now Earl Baker’s). You can see the old Orange Hall up the hill. Taken from Hibbert & Melissa’s back yard (now Earl Baker’s house). You can see the Baptist Church. Picture of the Old Maid’s house before it was moved up from the shore. Southeast Cove taken from Crooks’s Hill – probably taken mid-1940’s. Angela Crooks in the middle, with daughters Hattie and Ada. Will Day, Gilbert Cross and Willis Crooks probably all dressed up for church. David Crooks with his last team of oxen. David Wilson, Perley Levy, Sadie Crooks, Willis Crooks and Unknown. The child is Denzil (Bob) Cross. A busy harbour at Tancook. South East Cove. The South East Cove school house looks new and notice how flat the beach area is! Richard Levy, Norma Hirtle Baker, Delphine Crooks Boscoe, and Gerald Crooks. Background is Ella and Percy Young’s house and Hibbert Baker’s barn. Velma Wilson Dauphinee taken on oil barrels at Stan Mason’s Shop. Note the Mason Boat Shop in the background. Chester wharf many years ago, probably around 1930-40. The Crooks family on the back deck of the Shoreham, in the days before safety was an issue. Mabel, Joan, David, Willis, Gerald, Scott and Laurie. Estelle Cross with Nancy & Beverly Crooks and Sheila Rodenhiser, and Estelle’s boys, Wayne, Earl and Gary, on their way to Sunday School. Carroll, Delphine, Rodney and Gerald Crooks. Gerald is dressed up in his “warden” outfit. His job on Tancook during the war was to make sure the blackout was observed so the German subs couldn’t land an invasion force on Tancook. The house in the picture was Gabe Levy’s, now where Vincent Baker lives. The Gerald L. C., Tancook island’s first ferry. Over the years we have experienced many unusual incidents in our Crooks homestead over in South East Cove on Tancook Island. We have never tried to explain these strange events but have merely shared with others what has occurred during our many enjoyable summer vacations there. It’s been 12 years since anyone slept in the old house but we do visit once year for a day to touch base with our Tancook roots. On Tuesday, July 31, 2018, 15 of us dropped in, some of us choosing items to take away as reminders of the happy hours once spent in the old house. The old house is disintegrating around our ears and we are starting to remove things before the archeologists have a dig site. It’s what we were doing on Tuesday’s visit. Diane and Kim experienced another strange incident in the little bedroom upstairs that we refer to as Aunt Sadie and Uncle Brown’s room. This room has been the scene of several of the weird occurrences, the first being a visit from a cat that brushed Earl’s arm in the middle of the night. This was only strange to us because we didn’t have a cat. The incident on Tuesday was very similar to one that happened 40 years ago. At that time we had been in residence for 6 days. We were entertaining visitors in the kitchen when we all heard glass breaking. Everyone jumped at the noise and Diane, brave soul that she was, went upstairs to see if anything was amiss in Aunt Sadie’s room from which the noise had seemed to come. At first glance, Diane saw nothing out of order in the room but this being her bedroom for this trip to Tancook, she wanted to make sure nothing was wrong before the witching hour of 12:00 A.M. So she sat on the bed to have a better view of the room’s contents and looked to see where the broken glass might be. It was then that Diane saw the problem. The glass shade from the small oil lamp which rested on the wash bowl stand had fallen UP, a foot ABOVE and to the right of the lamp, and was wedged between the wall and the bar of the washstand – unbroken. Diane replaced the shade, went downstairs to report her rather strange and inexpiable find. In two seconds all the visitors disappeared as they hurried home where they thought they would be safe from the ghost. Deciding that the ghost was tired of having its home invaded and needed some peace and quiet, the Crooks packed their bags the next day and trotted back to Halifax on the last ferry. So back we come to last Tuesday’s visit. Our mission was to choose items for the Mississauga Crooks to take back with them as it’s time to clear out the homestead before it implodes on itself. Carol, Rod, Michael and Diane were present at the time of the first lamp incident, as well as for this second round. Diane and Kim were in Aunt Sadie’s room examining the little lamp of the aforementioned incident. When Diane took the chimney off the lamp to show Kim exactly how the shade was positioned all those years ago, the shade literally flew out of Diane’s hand, hit the wall, bounced off a storage bin and crashed to the floor. As it was on its way, Diane said,”Well I guess it’s broken this time,” and she pictured in her mind sweeping up the glass. But – and I’m sure you already guessed – the lamp chimney was once again, unbroken. The resident ghost seemed to be approving of the great adventure that awaited the lamp as it is destined to reside with Lyn and Glen in an expensive condo in Toronto with one of Mabel’s rocking chairs which found a home with Lyn years ago. If the “Tancook ghost of the lamp” travels along on the journey, Lyn and Glen should have some interesting experiences to share with the rest of us. With thanks to Susan Levy for these photos. Cow dumping – Back in the day when the fields were needed to make hay, the cattle would be taken to other island, dumped off the boat in this way and hauled to shore with a rope. They could swim, but the rope was to make sure they did not swim away. In the fall, the cattle would be herded back to the boat and brought back to the island for the winter. Roy and Connie Cross’s wedding reception in the old Orange Hall. Gary Cross, Brian Cross, Roy Cross, Connie Cross, Donna Langille, Trudy Cross, Mona Cross, next two unidentified. In back is Gary Stevens standing, Gladys and Willis Cross seated. Earl Cross, Debbie Mason, Norma Blades (sister of Pat Rodenhiser), Wayne Cross, Belinda Mason, Gary Cross, and Rodney Cross in front. In the early 70’s, the school children went door-to-door to raise money to purchase a refrigerator so they could have milk at the school. David Baker is kneeling, looks like Lorna Cross, Julie Jollymore and Ron Clothier standing to David’s left; Kim Cross and Robie Clothier in the cowboy hats; perhaps Troy Langille in the overalls.